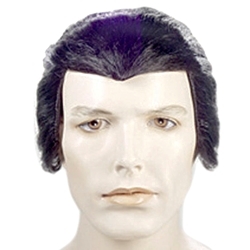 The Count Dracula wig features a short slicked back wig with a widow's peak, and an elastic band for a comfortable and secure fit to almost any head size and is available in black or red. A traditional style wig for Dracula available in both classic black and a brighter new take for vampires in a bright red (cartoon red). Pair with wig up with a snazzy suit and a cape to create a vampire costume that is unique to you for Halloween or masquerade parties. This wig is great for schools and theatres that are putting on one of the many variation of Dracula plays.